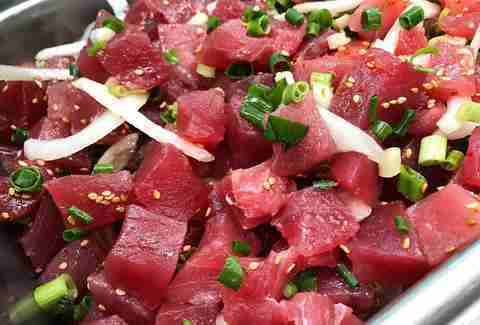 Before poke bowls became a worldwide phenomenon, in the islands it was just plain poke -- the awesome, cubed raw fish you eat at beach barbecues, weddings, when friends or family come to town, etc. 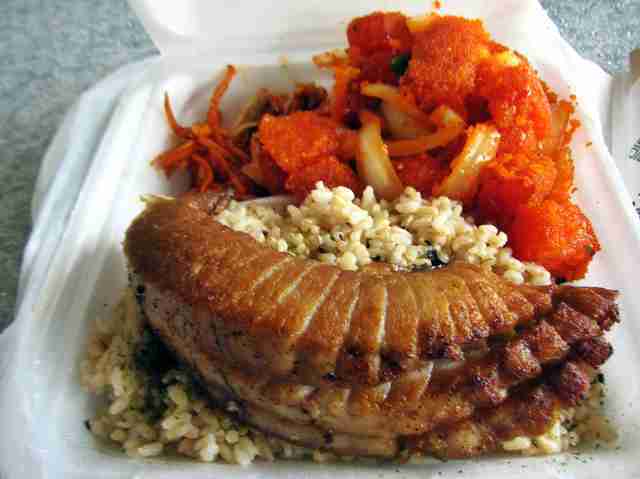 This centuries-old meal was once a simple meal for native Hawaiians, featuring cuts of fish mixed with sea salt and seaweed. As other cultures emigrated to the island, seasonings like shoyu and sesame oil were added and alternatives like salmon, tofu, and cucumber became another base option, evolving into the staple we enjoy today. And because we are the birthplace of the dish, we obviously offer the finest in all the land, so we rounded up our favorites because someone’s gotta do it, and it might as well be us. It should be no surprise that one of the best poke joints on the island is located just out of Waikiki in a neighborhood strip mall, because sometimes you find love in unexpected places. 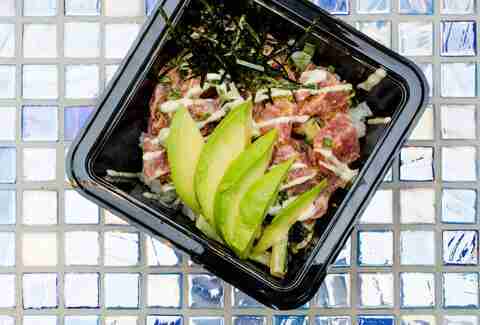 This grab-and-go eatery specializes in poke made from line-caught ahi, freshly made tofu, and vegetables grown by local farmers. Here, you can order by the pound or treat yourself to designer bowls like the HPC Shaka, made with an exciting medley of spicy ahi, Maine lobster, wasabi foam, yuku tobi, furikake wasabi salmon poke, ikura, daikon sprouts, and crispy salmon skin, all drizzled with kabayaki sauce. If you’re feeling artistic, you can design your own bowl from the poke bar and choose your meat and sauce, and sprinkle on the toppings until you’ve created your masterpiece. If you’re hungry and on the leeward side of the island, this family-run restaurant will keep your hangriness in control with bowls so big, the poke runneth over its Styrofoam container. Fish is freshly cut and well-seasoned, and the white rice comes with a sprinkling of furikake, which somehow makes everything taste even better. 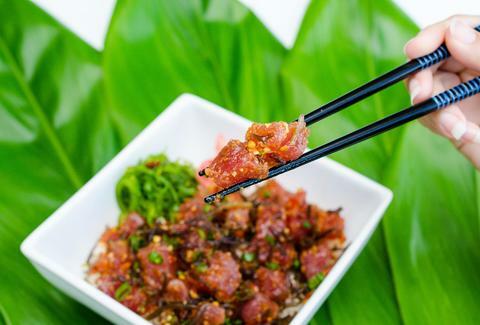 Try any of the expertly flavored options, but spice lovers will especially appreciate the spicy ahi poke, which packs the perfect amount of kick. For something a little different, opt for the poke nachos, a pound of spicy ahi or Hawaiian-style poke on a bed of wonton chips. Open since 1949, this family-run institution is tucked in the industrial stretch of Kalihi and has everything you need to survive: bottle of detergent for your laundry, over-the-counter medicine for your headache, boiled peanuts, crack seed, roast pork, li hing slushies, and an almost overwhelming amount of quality poke options. Their ocean-fresh offerings are sliced into generous bites and can be ordered by the pound, part of a plate lunch, or as a bowl. A short detour from the airport, this hole in the wall is the perfect stop for your first meal back to the island. And you can pick up that tube of toothpaste you forgot to bring and take out a massive snack before napping on the beach. It’s a win-win. In a neighborhood known for its Korean offerings, you’ll find Japanese-style poke bowls with fish bustled in straight from the Honolulu Fish Auction. All bowls and bentos come with miso soup, a warm complement to your meal of rice and raw fish. Here, options abound, where you can build your own bowl or choose from one of their specials and add a salad. If you’re looking for healthy options, the restaurant helpfully lists a “Did You Know?” fun facts about a few healthy ingredients like radish sprouts or watercress that may or may not sway your selection. Sure, it’s far from town, parking is terrible, and the line often spills out the door, but one bite of their fresh red ahi and all is forgiven, because this grab-and-go eatery specializes in high-quality fish, tossed in just the right amount of seasoning. With tons of tako, shellfish, and non-ahi poke options in addition to bento, plate lunches, and musubi, the most difficult part of your day will be convincing your stomach to be as big as your eyes. Getting here is half the battle, as it’s tucked in a small building off a busy intersection, but finding anything this fulfilling sometimes requires hard work. The other half of the battle is choosing what to order, because you know you’re getting the real deal when the restaurant’s slogan is “Caught here, not brought here. Slayed. Weighed. Filleted. Made in Hawaii.” Since everything is fresh, never frozen, the shop closes when supply is low or demand is high. Call ahead to find out if the Lunatic bowl is available -- ahi coated with just the right amount of spice, sans mayo. We’d also feel like it’d be neglectful to not mention their smoked ahi dip, which just might change your life. The family-run eatery is takeout only, so take your food around the corner to Beer Lab HI. When talking best poke on the island, there’s no discussion that doesn’t include this hole-in-the-wall seafood counter, which offers a simple, no-frills menu packed with classic local favorites. 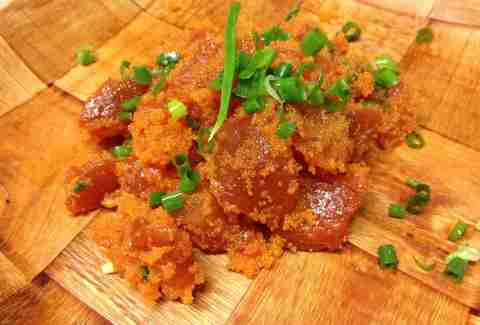 Poke here is made-to-order, with buttery soft ahi and tender tako flavored with shoyu, miso, sea salt, or wasabi. Parking can be tough, so come with a friend and have them drive around the block while you select your bowl. You’d think it’d be hard to miss a pale pink establishment shilling shave ice, sushi, and poke bowls, but this small, square building just off the Kinau Street exit tends to blend in when you’re stuck in traffic. 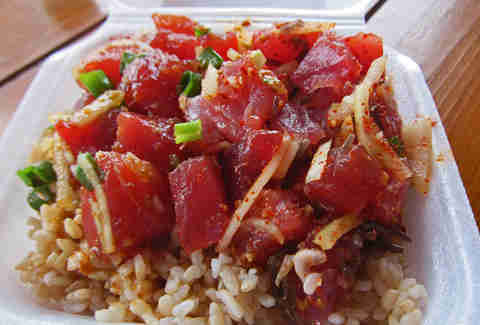 Next time you’re in the area, make it a point to fulfill your poke craving with sesame ahi, spicy ahi, or wasabi ahi. Park near the Honolulu Museum of Art, Queen’s hospital, or the Board of Water Supply and up your Omega-3s with fresh, sashimi-grade fish on a bed or lettuce, rice, or sushi rice mixed with cucumbers, daikon, and crab salad. Also, order online to avoid a long wait. First of all, a poke counter tucked in the back of a liquor store is probably the best idea ever, since you don’t have to make an extra stop to supplement your meal with your adult beverage of choice. Second, this poke is really, really good. Prepared daily with fresh island fish from the Honolulu auction, their sashimi-grade ahi is cut into thick cubes, giving it a smooth, clean taste. With options like jalapeño ahi, hamachi poke with ponzu sauce, scallop and kim chee tako poke, the selection is one of the best in the island. Like the name suggests, fish at this casual seafood deli is always fresh, but it’s the sauces that makes the dish. Try the traditional shoyu ahi poke, mixed with a thick layer of well-seasoned soy sauce or the spicy fireball poke, tossed in a spicy and creamy mayonnaise-based sauce that packs some serious heat. With over 20 options to choose from, in addition to plate lunch options, the hardest part is narrowing down exactly what your stomach wants and what it’s going to get. Tucked off a crowded, traffic-jammed street, this tiny grab-and-go eatery is easy to miss when you’re busy trying to beat that yellow light. But, don’t be deceived by their exterior -- inside, it’s a seafood lover’s paradise, with an impressive variety of poke and plate-lunch options. Portions are generous and prices are so fair that it’s almost hard to believe that you can find fresh, not-frozen ahi in such a small, innocuous shop. The self-proclaimed home of the original poke bowl began as a pop-up restaurant at farmers markets in 2008 before finding brick-and-mortar homes across Honolulu. Signature poke bowls are available, but freedom-loving eaters will delight in the build-your-own option. Choose your bowl size, white or brown rice, poke selections, and assortment of toppings ranging from crispy tempura flakes to fish eggs to Japanese favorites like natto and yamaimo. Helmed by two Japanese brothers who were formerly fishmongers in the famous Tsukiji Market, the siblings serve up gleaming red cuts of ahi in Kekaulike Marketplace and Lewers Street, hand-selected daily from the Honolulu Fish Auction. Of course, there are other fish options to consider, like hamachi kama, uni, and salmon sashimi, with just the right amounts of fattiness -- but when you’re dining at a shop named after a specific fish, you’ll want to honor its namesake by eating it first. The fresh, raw maguro is melt-in-your-mouth, don’t-want-to-share-with-your-best-friend good. An offshoot of Nico’s Pier 38 restaurant, the adjacent fish market features fresh fish, straight from the day’s auction block. 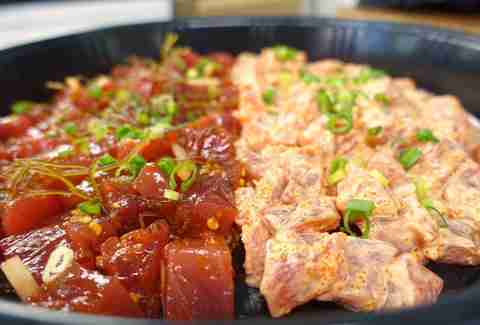 Like most markets, poke can be ordered as a bowl or by the pound. Behind the glass case, choices abound, but you’ll have to narrow your poke bowl choices to three selections, ranging from ahi, aku, marlin, tako, mussels, clam, shrimp, and house-smoked fish, which rarely disappoints. Summer Nakaishi is a freelance writer for Thrillist, who occasionally enjoys a diet of strictly poke and shave ice because sometimes you have to give the belly what it wants.